Plone - Salesforce Integration Service - Quintagroup provides Integration services of Plone CMS for Salesforce CRM. We have helped our clients to make their websites more powerful with features that Plone-Salesforce integration brings. Plone CMS Integration for Salesforce CRM is one of the services used to integrate open source content management system Plone with Salesforce.com. Linking together two powerful systems to create an integrated platform is really a pretty innovative idea. Quintagroup is a reliable provider of Plone CMS integration for the Salesforce CRM platform. We have helped our clients to make their websites more multifaceted with features brought by the Plone-Salesforce integration. Your Plone website can benefit from CRM integration, Salesforce.com's ability to model an organization's business processes. Plone integration for Salesforce can open a wide range of new outstanding features, that were not available earlier. With Plone and Salesforce.com integrated Plone site managers can receive much more control over members management and site overall performance statistics. Plone is a great web content management system. With its integration for Salesforce CRM, you can have it talk to your Salesforce.com instance in a number of ways. New Plone website users can register on the site, automatically creating a Contact in Salesforce with their profile data. You can create forms with PloneFormGen on your website to collect personal, contact, or any other information - and all the necessary data can be transferred directly to Salesforce. This can give much more control over the collected data. Wonderful combination of such Plone products as PloneFormGen and SalesforcePFGAdapter allows you to do that. Any types of files (word, pdf, Open Office) uploaded to Plone, for example, attachments to certain forms, can be stored in Salesforce. Generation of Word-, pdf- or any other format reports on the basis of data users fill-in in Plone. Since that data is stored in SalesForce it can be taken any time for reports generation on any request. Configure individual and mass e-mails sending to site users based on the desirable criteria. With Plone integration for Salesforce CRM, it becomes possible to use unique Saleforce functionality in Plone. 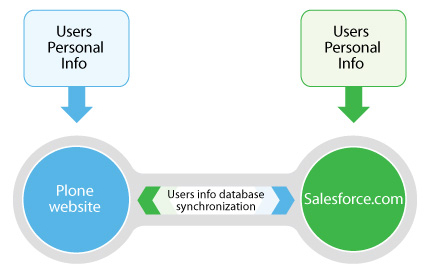 In any of the above cases, information entered by Plone site user flows automatically into Salesforce.com - no manual data entry is required! Interested in Plone Integration for Salesforce for your website? Contact us today for more information.